Due to decreasing prices of variable frequency drives, VFDs are being used on smaller and smaller systems, such as swimming pool systems. Nearly 40% of the total energy used by indoor swimming pools is consumed by the filtration and circulation pumps which are responsible for maintaining the cleanliness of the pool water. These pumps "recycle" the pool water by drawing it through a series of filters and chemical injection pools before returning it to the swimming pool. Filtration rates (set by government authorities) are intended to ensure proper standards of hygiene. The filtration and circulation pumps must be capable of pumping a required volume of water in the worst case scenario - when the filters are clogged. New filters have a low resistance to flow is very low, so excessive amounts of water are circulated through the pool. The filters then experience a period of high wear until they become clogged and the flow rate they experience decreases toward design conditions. With public safety at issue, these pumps are usually oversized. 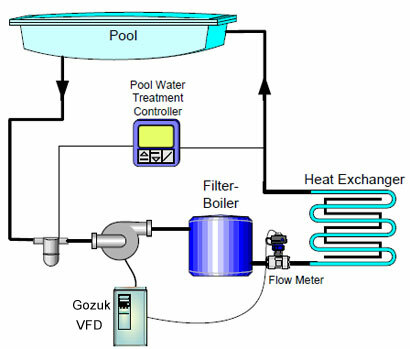 Variable frequency drives can be added to swimming pool filtration and circulation pumps very easily to eliminate the wasted energy due to the worst-case design philosophy and safety factor considerations. The variable frequency drive is installed along with a flow-meter to guarantee the appropriate water volume. The pump slows down to match actual demands. Initially, the VFD will operate at a reduced speed while the filter is new and has a low resistance. 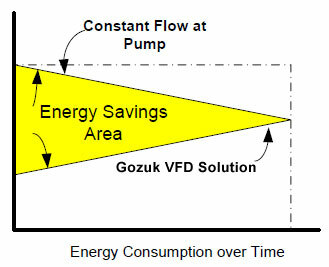 As the filter becomes polluted, the VFD will slowly increase the speed of the pump to maintain the design flow rate. When the pump nears a predetermined frequency, usually near maximum speed, the VFD can signal an alarm indicating it is time to clean or replace the filters. This can also save on labor and material costs and time. When the pump is not regulated the speed is always 100%, but the flow changes. Initially, when the filter is not clogged, flow rates will be higher than design, but the filter will become clogged faster. This results in more operating hours near design flow and pressure. 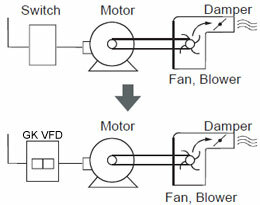 When under VFD control, the flow will always remain the same, but the pressure required to maintain that flow will vary. Flow meter is to be installed to accurately regulate the filter pump. Using internal variable frequency drive PID controller reduces costs. Variable frequency drive spare relay contacts can be configured to signal clogged filter when VFD reaches 100% speed.